Mountainous areas contain hundreds of millions of years of history, stretching back to the earliest continental landforms; they are often so large they create their own weather patterns. Yet despite their daunting size, mountains are affected by growing local populations, as well as by distant influences, such as air pollution and global climate change. 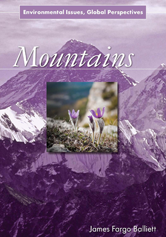 The case studies in Mountains consider how global warming in East Africa is harming Mount Kenya's regional population, examine the fragile ecology of New Zealand's Southern Alps, and discuss the impact of mountain use over time in New Hampshire's White Mountains, among other critical issues.